Just last week, John Carmack was waxing poetic about an untethered Oculus Rift experience powered by Android and a system-on-a-chip. Well, seems like the Oculus Rift CTO's vision has come to fruition. CEO Brendan Iribe announced today at GamesBeat 2013 that the company is definitely working on a lighter mobile virtual reality headset aimed at consumers. 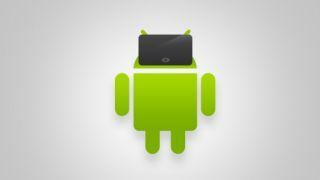 The headset will use the Android device's processor, according to Iribe. If that isn't exciting enough, the team is shooting to launch the mobile version with the PC headset in 2014, which means we would see the device next year as opposed to our previous 5-year estimation. The Oculus blog further elaborates a standalone headset as the future of virtual reality noting that an Oculus Android software development kit is already running, with the team "working on core optimizations for mobile chipsets now." While the Android SDK is merrily frolicking with the Oculus, it seems like iOS has been left in the dust. The lack of Apple support hasn't been addressed by the company yet, though it's apparent the Android OS is a more open platform for console gaming devs - with the Android powered Nvidia Shield, Ouya and Mad Catz Mojo being a few notable examples. Rift doesn't see Apple's absence as a hindrance, either. As quoted by Venture Beat, Iribe said, "We have some exciting plans on the mobile VR side as the PC VR side ... It's pretty incredible what [John Carmack has] been able to do." Iribe also echoed Carmack's sentiments about watching television and movies in virtual reality home theaters as a possibility. Seeing that a mobile Rift system is almost here when we thought it would take much longer to hit the market, this concept doesn't sound too far off either. The new Archos Gamepad 2 also packs Android OS.